Ever look in your wardrobe and think you've got nothing to wear? Only to go shopping and discover everyone has bought the same stuff… Well, there is an answer to this sartorial conundrum and that is to create your own clothes, or at least know how to modify pieces enough to give yourself a wardrobe that you can genuinely say no one else has. So, where do you start exactly? 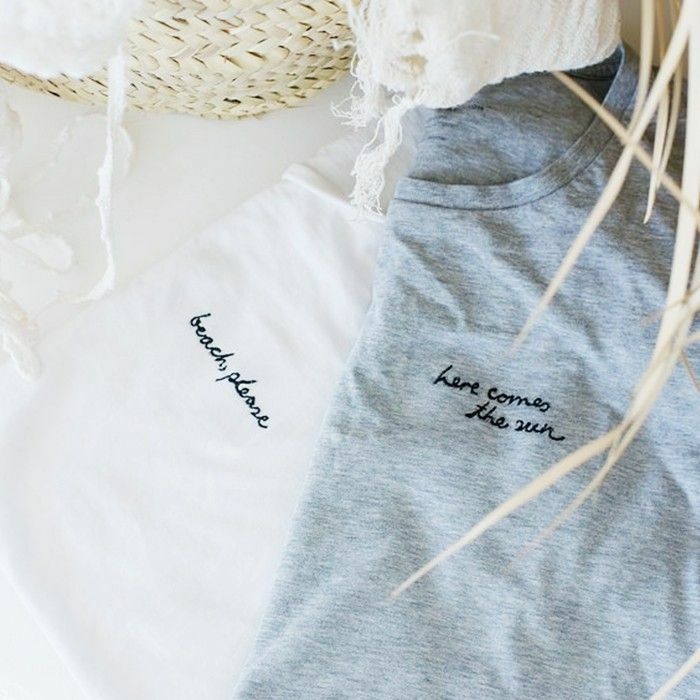 We turned to Geneva Vanderzeil, who runs the phenomenally cool DIY clothing blog A Pair & a Spare to pick four of the chicest tutorials that she's ever created. From deconstructed jeans (Vetements, eat your heart out!) to a new way to update your plain white T-shirt, you'll learn a new skill and get new clothes in the process. Win, win, we think. Keep scrolling for new ways to update your wardrobe with four DIY tutorials. When is a T-shirt totally unique? When you've added your own embroidery of course. 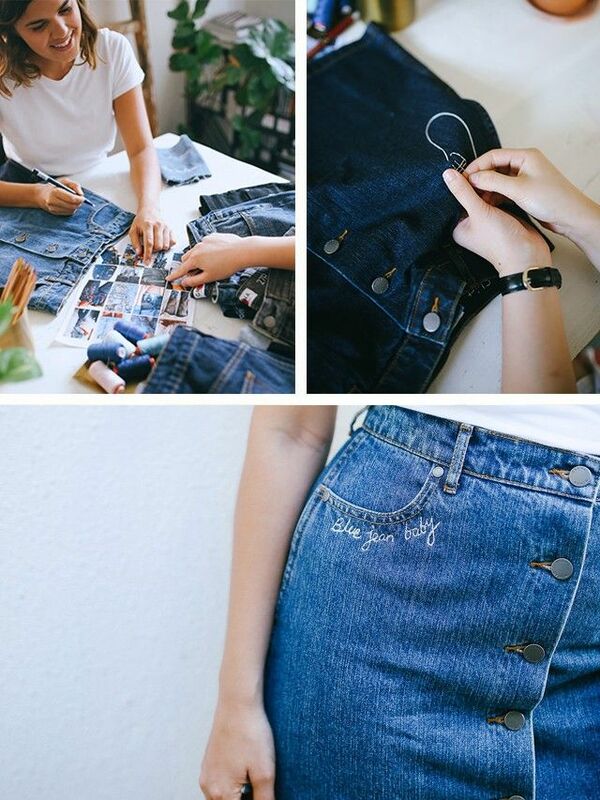 Here, Geneva lays out exactly how to do it with a bit of hand embroidery, while the tutorial looks like it's for jeans, it can be used for both. 1. Using a pen or fabric chalk, write or draw your design on the denim. You can do it freehand in a cursive script, but you can do a simple block letter if that’s easier. 2. Thread your needle with two lengths of thread (this will allow you to create a thicker line). 3. Using a basic running stitch, follow the outline of the writing or drawing. 4. Knot the thread on the inside of the jeans to secure it each time you finish off a length of thread. Top tip: When drawing on your designs, it's best to use a pen or chalk in a colour as close to the shade of denim as possible (without being invisible to the naked eye) so that it doesn’t show through. If you're handy with a sewing machine, try this tutorial. Want something totally unique that no one else has? Why not try this cool belt idea? 1. First you need to work out the right length for the buckle piece—do this by wrapping them around your waist and lining them up in the middle—you want to leave a gap so that your belt end section can fit in. Mark on the back where you need to cut your belts. 2. 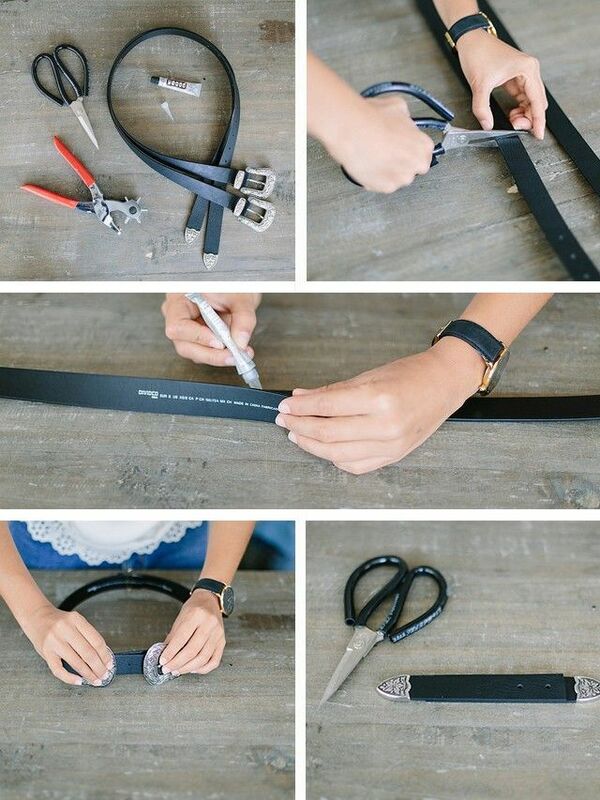 Cut your belts to the desired length. You can do this slowly in stages so that you’re sure you won’t cut too much. 3. Once you have the right length, glue them together. This join will be at the back so shouldn’t be too noticeable—you can also sew if you want to or use a stud to attach them together. 4. Now you have to cut your ends so that you can attach them together to make the single middle piece. If you are using plain belts you can just cut a section, add some holes and away you go. Because we were using these western belts with fancy ends (and we couldn’t get the ends off) we had to attach two together. I first cut mine to a rough size. 5. Slot them into the belt buckles and make a new belt hole if you need to. 6. Then, wrap the belt around yourself so that you can check the length is good for the ends. Trim them if necessary, and then you want to glue them together. In order to stop the join being visible, overlap them so that the join lies under one of the belt buckles. Follow the tutorial from the YouTube video below. Top tip: You’re basically turning two belts into one, which will in fact be two pieces—a piece with two buckles and a piece with two ends. You need to work out the right size of each of these pieces for you, and then join the sections together. It may look tricky, but it's actually super easy. Much like the rest of the fashion world, we've been obsessed with the deconstructed Vetements jean. However, if your purse can't stretch to that, then why not try to create your own version? Check out the tutorial below. 1. Lay the jeans flat on the table, back pockets facing up. 2. Unpick the pockets from the pants. It's easiest to start from the corners. 5. For the hem, cut up along the side seam about 5 cm. 6. Then cut straight along the front [horizontally] of the pant leg. 8. To make the seam line in the leg of your jeans, mark with a pin at the height of your knees and cut straight through [horizontally]. 11. Sew the back pockets back on in their new position and you’re done. Head over here for even more detail on this tutorial. The off-the-shoulder trend isn't going away. But instead of wearing the same dress that everyone else has, why not make your own? Now, we realise that this is a little more advanced than a few of the other tutorials, but the handy step-by-step guide is super easy to follow, no? 1. Cut a tube of fabric two times the measurement around the top of your bust (where the top of the dress sits in the above photo). 2. Sew the long edge together so you have a tube. 3. Then, finish the top and bottom hems, ensuring the top has enough room for the elastic to pass through the back half. 4. Thread your elastic through the back half. 5. Lay it out so the flat section is the front and the gathered section is the back. 6. Sew the elastic in place on the ends by securing it to the fabric. 7. Now, you’re going to make the arm ties. These are 50 cm long (20 in) and about 7.5 cm wide (3 in) in total before sewn. Now simply sew two tubes for the arm ties, leaving one end open for you to turn the inside out. 8. Turn them inside out and then iron flat. Sew the open end shut. And then attach them under the arms to the main dress, Geneva recommends to do it a few centimetres closer to the front than the seam. Want to add a high-fashion element to your creations? Why not add one of these super-cute Anya Hindmarch stickers?